Lock in a great price for Santa Clara Marriott – rated 8.2 by recent guests! If I didn’t have ear plugs the air conditioner would have kept me awake. The fan in the restroom didn’t work and for being affiliated with the ritz the mattress was quite hard and a bit lumpy. I did get a good view overlooking the garden after 3 unacceptable rooms although I may have accepted the room next to the elevator or overlooking the rooftop air conditioner if I’d known the air conditioner was going to be so loud. The facilities and staff where great, but bathrooms need updating. Proximity to Levi Stadium and a quick Uber ride to Santana Row. Has a great breakfast buffet. The new Sports Bar in the lobby was fun. Marriott staff was nice. I’ve always enjoyed our stays at Marriott due to fast service and courteous staff. Yess really nice hotel with a great location it’s near everthing love my stay here . Everything is close by. Facilities are very nice. There is construction going on but it had the proper dust walls installed and noise was very nominal. The upgrades will be beautiful. Restaurant sports bar had excellent food for value and service. They were very accommodating with children. They engaged with the children and had their food out first. This weekend was set up by our daughter. We usually don’t travel on a holiday weekend because it is so busy, but Marriott made the weekend feel like a family vacation. Thank you. 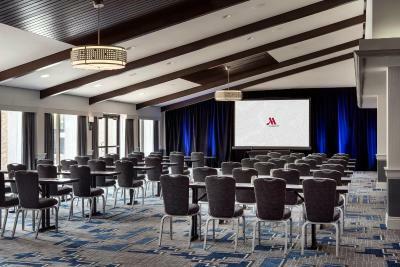 Santa Clara Marriott This rating is a reflection of how the property compares to the industry standard when it comes to price, facilities and services available. It's based on a self-evaluation by the property. Use this rating to help choose your stay! Guest rooms provide WiFi, an iPod docking station, a desk and a seating area. They also have hairdryers and ironing facilities. 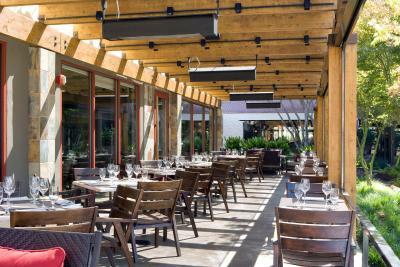 Marriott Santa Clara offers picnic facilities and 2 restaurants that serve American cuisine. It has a bar and on-site Starbucks. The hotel is equipped with meeting rooms and a business center. Currency exchange, car rentals and shoe shines are available to guests. 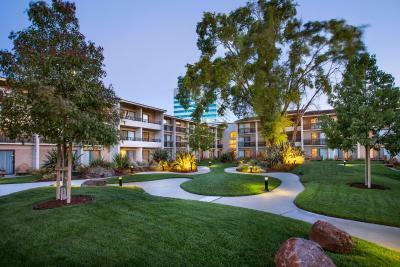 Santa Clara Marriott is 5 mi from San Jose International Airport, 5.6 mi from Zumiez Great Mall of the Bay Area and 6.2 mi from Winchester Mystery House. It is 13 mi from Stanford University. 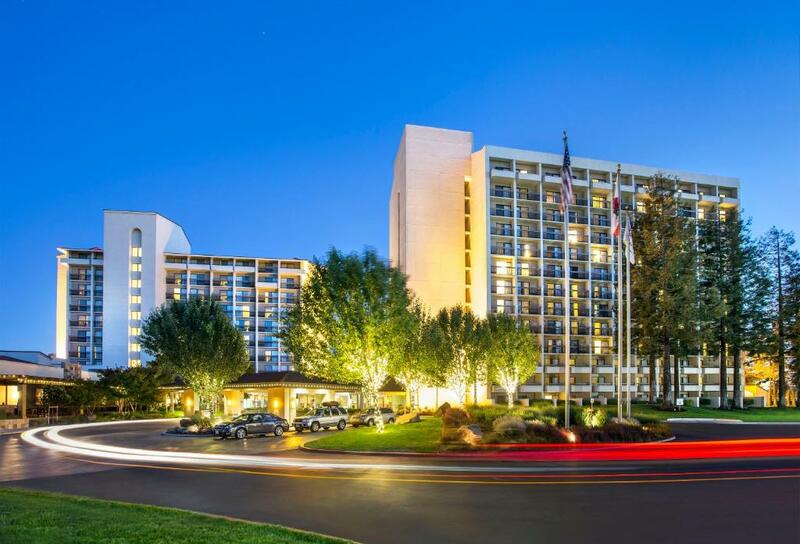 When would you like to stay at Santa Clara Marriott? This air-conditioned room includes a flat-screen cable TV with pay-per-view channels, an iPod docking station and a work desk. Concierge Level access is included with this room and comes with a hot buffet breakfast, midday snack, hors d'oeuvres, and dessert. Free nonalcoholic beverages are also provided as well as an Honor bar. Evening turndown service is also offered. This air-conditioned room includes a flat-screen cable TV with pay-per-view channels, an iPod docking station and a work desk. This quadruple room features air conditioning, soundproofing and iPod dock. This quadruple room has a executive lounge access, flat-screen TV and soundproofing. 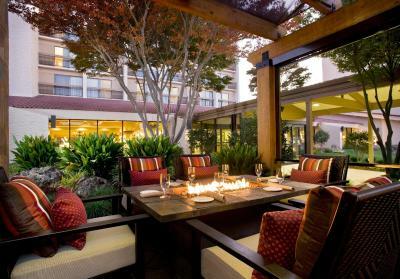 Enjoy upscale amenities and an ideal Silicon Valley location at Santa Clara Marriott. 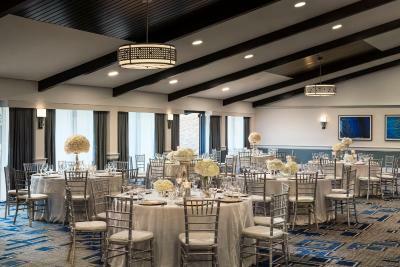 Our hotel in Santa Clara, CA offers stylish guest rooms, two restaurants, a Starbucks, 24/7 gym, outdoor pool and more than 27,000 square feet of event space. 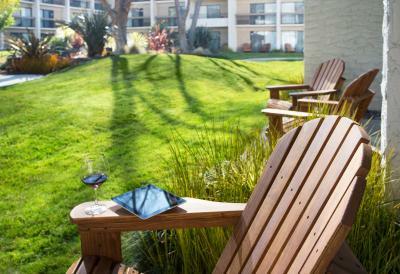 House Rules Santa Clara Marriott takes special requests – add in the next step! Santa Clara Marriott accepts these cards and reserves the right to temporarily hold an amount prior to arrival. Breakfast included package is only valid for up to 2 adults and children (under age 12) per room. Please note: Self-parking is available for a fee and valet parking is available for a fee as well. Contact the property for more details. How the kitchen manager REFUSED to let my two kids eat their breakfast because I didn't know we had to pay. Most hotels give you free breakfast in the mornings. After serving my kids their food, the hostess said ask if we paid. I said no didn't know we had too. That's a shame my kids were already took couple of bites of their food and was told they can't finish it. Never coming back. You dont turn away kids from eating food. The price of the room changed , and was priced highter the following week. That you have to pay for parking $15 a day EXTRA and i don't recall it being stated anywhere AND you had to pay $14 a day for internet! Really? No free movies, just cheapo TV. You had to pay for EVERY little thing. My son didn't care for the room service terriyaki sandwich, but fries were good. Bed uncomfortable. Tried to charge more money for my room. Noise level was out of control. Hard to sleep. It was close to Levi's stadium. Parking confusing when went into area looked like supposed to go up to upper level, found out no elevator, no access for people with disabilities. Went back down to first level and found send area to park which was farther away making it difficult for people with disabilities. The restaurant Parcel 21 was confusing about what time breakfast buffet was served. Did not have hair dryer. Bed was comfortable. The location was great.